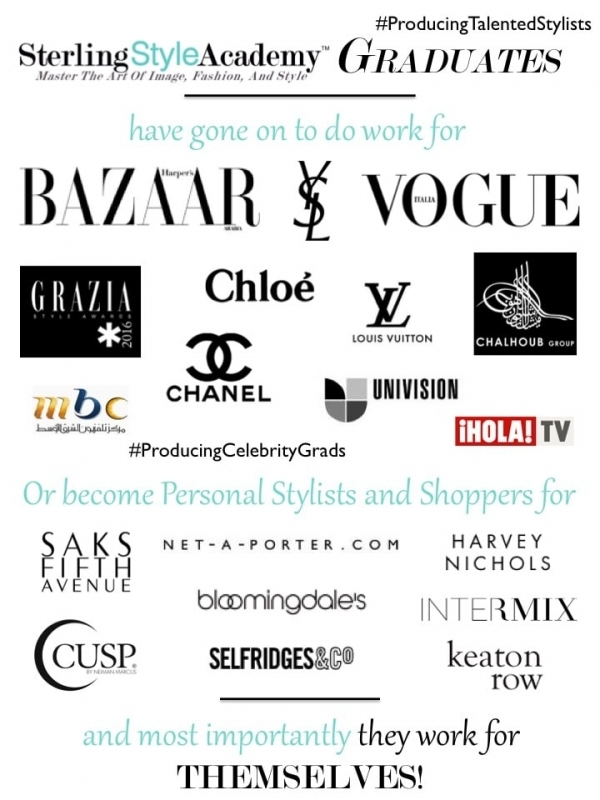 The Sterling Style Academy is so proud of the success our global graduates have achieved. Due to each Certified Personal Stylist and Personal Shopper's business savvy to apply the tools and knowledge they learned from training with the Sterling Style Academy, they have become personal shopping and personal styling pioneers in their home cities and countries, including Japan, Trinidad, Chile, Italy, Dubai, Nigeria, Russia, Guatemala, Colombia, the United States, and Saudi Arabia. Each of the Sterling Style Academy Certified Personal Stylists and Personal Shoppers featured are not only pioneers in their industry but they are all self-motivated, go-getters. They have a true passion to become successful image consultants and personal shoppers and they implemented their education into a viable career in different parts of the world. Not only do they jet set to work with clients but they are also driven, motivated, and take advantage of opportunities when they appear. These are the true characteristics of successful and dynamic entrepreneurs and we are very proud of them for achieving their goals. Some of our graduates were as young as 23 when they started, proving age does not make a difference in professional image consulting, personal styling and personal shopping. Those who graduate from the Sterling Style Academy all share the abilities to put their education to use in their businesses, market themselves appropriately according to the tools they learned in class, and most importantly, they are not afraid to take risks. Sterling Style Academy's training director, Michelle T. Sterling, who co-authored the book, Success Simplified, motivates students through her own drive and business savvy to do the same in their market. Students recognize that to be successful in the image consulting and personal shopping industry, it takes personal conviction and the confidence to take smart risks. Our graduates take this cue from our internationally recognized alumnae and staff to build successful businesses for themselves in their own region or country. This is what makes the Sterling Style Academy so unique and globally recognized as a leader in producing top-notch personal stylists and personal shoppers. Another key to success for each of our featured alumni, is their investment in their continuing development as image professionals through our training materials. These valuable training products incorporate instructional training workbooks and dvds that our graduates can future reference upon the completion of their personal stylist and personal shopper training. The Sterling Style Academy trains globally diversified image consultants and personal shoppers who not only become pioneers in their countries but also are based all over the world. Many of them take advantage of the Sterling Style Academy's "Corporate America," success oriented mentally - incorporating our methodologies in their best business practices. International students who have chosen to educate themselves in New York, Miami, or Los Angeles have also benefited from the American shopping experience. Those who have enrolled in our international programs in Dubai, Mumbai, Mexico, Brazil, London, and Hong Kong have truly mastered the art of international shopping combined with a structured methodology for conducting personal shopping sessions outside of the United States. Image consulting and personal shopping is not only a growing industry worldwide, but is also one that is financially viable, no matter where in the world you launch your business. Regardless of where you live and if your training takes place in the United States or by an American-based personal shopping training academy, the principles and core competences you learn at the Sterling Style Academy are universally accepted worldwide. Latina Celebrity Daniela DiGiacomo is a graduate of the January 2012 Miami Image Consultant Training Program. Prior to getting certified as an image consultant, she won the title of Miss Best Style while winning the beauty pageant title of Ms. International in 2006. She currently hosts numerous TV shows for Univision, Hola TV, and TNT Latinamerica while providing image and fashion consulting services to a prestigious group of clients in Miami and in Latin America. In April 2016, People Magazine en espanol named her best dressed while she was hosting Premio Lo Nuestro for Univision. Kudos to Daniela DiGiacomo for capitalizing on all her achievements and publicity to continue to pursue her love of fashion and expand her image consultancy business to provide fashion, style, beauty, nutrition, and fitness advice. Karla is a graduate of the Miami April 2015 3-Day Color Consultant, Fashion Stylist and Personal Shopper Short Course in Spanish. Trained by our training director, Michelle T. Sterling, Karla chose to attend the Sterling Style Academy to diversify her skill sets as a fashion designer utilizing the information that she learned to launch her women's collection and expand her brand into the United States. She also plans to diversify her business to include personal shopping for her clients on an international level. Hala is a graduate of one of our Dubai 2013 training programs and soon after graduation was featured in Arab News as Saudi Arabia's first notable fashion stylist to socialites. She was quoted saying, "How did you launch your career as a fashion stylist? I first began my venture into styling about two years ago. I used to shop and style close friends and family. Gradually, more people began to inquire and request my services and I realized that I have a knack for styling, which encouraged me to pursue a career in this domain. I began first with a certified intense educational course from the internationally renowned Sterling Style Academy based in New York City. After earning the degree, I came back to Jeddah and launched my new career." Click here to see the entire article. In 2015, Hala has also been featured in the Saudi Gazette. In 2016 she was featured as Bazaar Arabia's Best Dressed, in Grazia Magazine Middle East, hosted an event for Vogue Italia in Saudi Arabia, and was honored with an award in 2017. An Instagram Influencer, she's an excellent example of following her passion. Since graduating from the Sterling Style Academy in 2014, Mayssa Assaf has quickly shot up to the top appearing on many Arabic TV stations such as Dubai One, LBC and MBC, as well as in many Arabic magazine publications both as a featured stylist in Ahlan + Sayidaty and on the cover of a Mondanite magazine. She is multi-talented producing TV style segments for her own YouTube channel as well as being featured on television shows both in front of the camera and behind the scenes. She's turned her love of beauty, image, fashion and style into a career that she is taking by storm! Stiliana Pernicheva is a graduate of the Sterling Style Academy 2015 Dubai Image Consultant Training Program. Within one year of graduating, she became the winner of the 12th BFAs in Dubai, UAE for the category of Fashion PR and Style Consultants. She was awarded for being the most active to globally implement the concept of image, fashion and style from Dubai to Europe. And in 2017, she has was asked to appear on Bulgarian TV for several style segments to showcase her knowledge as an image consultant and fashion designer. Lucy is a graduate of the 5-Day Personal Stylist and Personal Shopper Training Program in Miami in January 2013. As an Armenian American TV Show Host, Personal Stylist, and Fashion Stylist, Lucy Samuelian, turned her dream and her passion into her reality as a TV Personality and stylist on the Glendale Life Reality TV Show. She travels around the world shopping and styling her clients and has been featured on several other TV programs worldwide for her amazing styling talents. Her most notable styling gigs were for Maxim Magazine and hip hop artist, Akon. Faisal Al-Ghazzawi of Jeddah, Saudi Arabia is a 2016 Men’s Certified Image Stylist graduate of the Sterling Style Academy in Dubai. The Sterling Style Academy is fortunate that we attract multi-talented individuals to attend our courses as Faisal started his interest in fashion by modeling and then his passion later evolved into styling photoshoots, styling others, and hosting events for brands. In less than a year, Faisal Al-Ghazzawi is an Instagram Influencer and Brand Ambassador, representing and working with many luxury and Saudi brands with their promotion. He has already been featured in Arab News. Japan’s leading image consultant, Yuuri Takano, is an author, trainer and consultant to individuals and corporations in Tokyo and Japanese companies and expats in New York. Yuuri Takano has an English Literature degree from Meijigakuin University and received a certificate from Best College in image consulting in Tokyo. Her training with the Sterling Style Academy in New York combined with her solid styling skills make Yuuri sought out by celebrities, modeling agencies and corporations throughout Tokyo and Japan. Since graduating from Sterling Style Academy’s 2.5 Week Miami Image Consultant Training Course in early 2010, Ameriga Giannone has established herself as the premiere image consultant, make up artist and hair stylist for South America. She is also a director for Tu Closet. Fluent in Italian, Spanish, English, Portuguese and Japanese, Ameriga has positioned herself as a worldwide image consultant with her Sterling Style Academy certification. In 2011, she became a TV personality, hosting a show called "Personal Shopper: Al rescate de tu imagen!" A graduate of the January 2011 class in Miami, she was born in Guatemala from an Italian father and Spanish Mother. From a very young age Maria Cristina showed a strong interest for fashion and aesthetics thanks to the influence her grandmothers and her mother played in her life. Three very different women who always knew how to conduct themselves thru life with much style and grace. She’s passionate about arts, beauty and aesthetics, etiquette and good manners and of course the art of knowing how to dress in style. She studied fashion design at the Istituto Marangoni in Milan, Italy and also has a Bachelor in Business Administration. She has experience with make up, modeling and worked for 7 years as Creative Director of Azahares, a candle making company her mother started in the year 2000. Maria Cristina now works and lives in Guatemala, a country that has opened doors for her and to whom she owes a great part of her identity. Aside from working with private clients, she also has a weekly television segment called “Style Sessions” every Tuesday at 9:00am at Canal Antigua. She’s a personal shopper for two well-known Spanish franchises, MANGO and Adolfo Dominguez. She’s a guest columnist for El Periódico, a local newspaper. She’s a style consultant and personal shopper for Oakland Mall, one of Guatemala’s most prestigious shopping centers, and she’s been invited to teach at two of Guatemala’s fashion schools, UNIS and LLatzer. Maria Cristina also has her own style blog. After a successful career in financial services, investment banking and international trade consulting, Dzigbordi put her passion for wellness, grooming and image at the forefront of her career. Dzigbordi K. Dosoo is the founder and Chief Executive Officer of Allure Africa Group and a professionally trained Image Consultant. She is regarded as a leader in the Lifestyle Industry in Africa and a strong advocate for promoting industry standards. She believes that image is everything and this has led her to many organizations across Africa - delivering tailored programmes and seminars for the business sector, organizing frequent workshops for the public institutions, and personal consultations for individuals. Through The Dzigbordi Show, she has carved a niche for herself for affecting people’s lives, encouraging individuals across Africa regardless of age, size and shape to discover their personal styles. What makes her stand out is her expertise in the areas of Wellness, Grooming and Image, allowing her to take a holistic approach to the individual leading to a transformation that is sustainable which then becomes part of their daily lifestyles. Her ability to engage, inspire, inform and impart knowledge has made her a highly sought after speaker. Dzigbordi was named the prestigious “CIMG Marketing Woman of the Year” 2009. She is currently the Chair Lady of the Spa Association of Africa, the First African to Co-Host the invitation only Global Spa Summit and she has been featured in Top International and Spa Industry Press such as Spa Business Magazine, The Spa Hand Book Women’s Wear Daily, Pulse Magazine from the International Spa Association and Business in Africa among others. She is frequently seen on TV and heard on radio in Ghana as a an expert on lifestyle issues. Dzigbordi’s social responsibility efforts include serving on the governing Council of United Way Ghana, a trustee of the Children’s Heart Foundation Ghana, a member of the Zonta Club of Accra II, and the Complete Renewed Equipped Women (CREW). She has a passion for young ladies believing that they can fly no matter how unconventional they are, and is a mentor to many. In addition to various Spa Management Qualifications, Dzigbordi is a Certified Image Consultant from the Sterling Style Academy. Educated in the United States, she holds an Economics and Finance Degree from Virginia State University and Executive Education from Harvard University. Upon graduating from Sterling Style Academy Miami in January 2008, Ms. Garzon conducted her first corporate seminar within 2 weeks of graduation. She passed the AICI First Level Certification program in May 2008 and is now certified through both the Sterling Style Academy and the Association of Image Consultants International. She currently works with cross cultural executives and corporations in Miami and Venezuela. Formerly a CBS sales executive, Ms. Laymon provides fun shopping experiences in the New York area for the women of all ages. She passed the AICI First Level Certification program in May 2008 and is now certified through both the Sterling Style Academy and the Association of Image Consultants International. In 2011, she authored a booked call "Crossing Swords." Carolyn Curtis, Wardrobe Consultant who graduated from the April 2010 class in New York. She helps women look and feel fabulous by dressing their best no matter what the occasion. Her expertise and personal service allow her clients to save time and money while building a wardrobe that fits their lifestyle, silhouette, and budget. Carolyn also represents an exclusive line of women's apparel and accessories from the Doncaster Collection, the secret of many well-dressed women. A Sterling Style Academy Certified Image Consultant and Personal Shopper at Saks Fifth Avenue in Miami. A Sterling Style Academy Certified Image Consultant and Personal Shopper at Harvey Nichols in London. A Sterling Style Academy Certified Image Consultant, Personal Stylist & Personal Shopper graduate. Image Consultant and make up artist at BISA Colombia. Instagram influencer and YouTuber. Graduate of New York 4 Week Course - August 2005, is a 2 time author, trainer, consultant, and public speaker. Graduate of Miami 2.5 Week Course - Janaury 2008, is co-founder of TimeSquared, LTD. a leading personal styling business pioneering the industry in Trinidad and Tobago. "Hi Michelle! So great to hear from you! Business is great! No plans to be (in Miami again) as yet but I'm always doing some last minute jet setting so I'll be sure to let you know. Hope all is well. I really look up to you and admire you for what you have done for yourself! - Amy Inglefield"
Graduate of Miami 2.5 Week Course - January 2010 is a make-up artist, fashion stylist and personal stylist in Santiago, Chile. She travels between Chile, Argentina, and Italy to work with clients - shopping for them globally. "Hey Michelle - How are you!? Things are doing great here - I actually was invited to a TV program to solve the problems of a compulsive shopper and it went on air yesterday! I had a million contacts today; it was great publicity! Here is the link: http://www.24horas.cl/programas/informeespecial/2010/ (Its in Spanish.) Looking forward to hearing from you. - Ameriga"
Graduates of New York 2.5 Week Course and Las Vegas 5 Day Course - April and September 2010 - are still launching their business in the very new image consulting industry in Nigeria. They are setting themselves up to be image consultant and personal shopping pioneers in their industry. They conducted their first seminar in November 2010 and had to turn people away from attending their program as it was over booked! "Hi Michelle! We've talked about you all week & even just concluded on sending a message today. We are doing great! Putting finishing touches to the website and holding a seminar by the end of Nov. Sure we'll keep you posted. Regards, Yetunde"
"Hallo Michelle! Everyother thing is going on smoothly according to plan and you will be hearing from us shortly! I see there's a lot going on at your end - as usual. Hope you are well and do take care. - Alero"
Graduate of One-on-One Training - June 2010, incorporated her interior decorating business with image consulting - immediately generating clients. mother of two this career fits so well with managing my family. I recommend the in person training - so valuable to have the face to face contact and knowledge provided. I reflect on my training often when working with my clients. Feel free to contact me at ann@anndamonreilly.com if you have any questions. www.anndamonreilly.com is my website." Graduate of the 3-Day Short Course and 5-Day Corporate Image Consultant Training Program in New York - September 2012. As a radio show host and key note speaker, Ms. Adetu has been recognized for her commitment to excellence in the image and etiquette field being interviewed by a notable African journalist and featured on the cover of Life Magazine by The Guardian Newspapers in Africa in 2015. Graduate of the 5-Day Personal Stylist and Personal Shopper Training course in December 2015 in New York, Angeline took the bull by the horns and set up her website, blog, and social media pages within one month after training. And just 7 months after graduating, she has already forged partnerships with her local mall in the Tampa, Florida area. That's utilizing your training to it's fullest potential! The Sterling Style Academy Training Director helped Angeline come up with her business name, the FabuLess Stylist, based on Angeline's unique background and business goals. See what our Alumni say about us. And visit our Instagram to see what some of our graduates are doing now.